Ready for another great Singles Day beauty deal 2018? B-glowing is running Holiday Beauty Bundle ($250+ Value) with orders $175 or more + secret special Singles Day page you must see! Lord & Taylor is offering beauty bag with any $100 beauty purchase. If you missed Target x Dermstore beauty box past Sunday, read on! b-glowing (NEW)(VERY HOT) Receive a b-glowing 2018 Holiday Bundle $250+ Value free with full-price b-glowing.com Orders $175+ (before discount). (NEW) Shop all B-glowing exclusive singles day offers here. One gift is OOS already, don’t wait! (NEW) Get 30% off Beauty Editor’s Picks orders $60 or more with code BEAUTYEDITORS! Valid 11/7 – 11/14. You can pay approx $123 after discount and still get the beauty bundle. (NEW) Get 25% off Trending Picks orders $60 or more with code TRENDINGPICKS! Valid 11/7 – 11/14. (NEW) Get 20% off b-glowing orders $50 or more with code 1111TWNTY! Valid 11/7 – 11/14. (NEW) Free Gifts from Erno Laszlo, SK-II, NuFACE, Christophe Robin, Sunday Riley and many more! Limited supplies, check out all offers now! (NEW) Get the slip X b-glowing – Pink Kitty Beauty Sleep Collection for $92.50 with code 1111TWENTY! Valued at $135! (NEW) Through 11/14, get 20% off on orders $50 or more use coupon code 1111MOON. Lord & Taylor (NEW) Receive a burgundy cosmetic bag filled with nine fragrance samples with any beauty or fragrance purchase of $100 or more. (1d) GIFT 2: Choose 3 extra Lancome deluxe samples with any $75 purchase from Visionaire Nuit, Absolue Premium Bx Night, Renergie Lift or full size Makeup gift. Total gift worth up to $171 value. Enjoy deluxe samples of Tonique Douceur Alcohol-Free Freshener (1.7 oz), Visionnaire Advanced Skin Corrector (0.25 fl oz) and Visionnaire Nuit Multi-Correcting Gel-In-Oil to smooth and correct with your $75 Lancome purchase. Enjoy a deluxe sample of Rénergie Lift Multi-Action Night Cream to lift and firm (0.5 oz), Advanced Génifique Youth Activating Concentrate (0.27 fl oz) And Tonique Confort Rehydrating Comforting Toner (1.7 oz) with your $75 Lancome purchase. (NEW) Gift with Purchase: Klorane Peony Shampoo and Conditioner ($18 value) with any $100 purchase. Bluemercury (NEW)(Today only) offers enjoy 15% off your purchase of $150 or more use coupon code BLUEMOON. (2d) Frequent Flyer Sample Bag at Bluemercury! 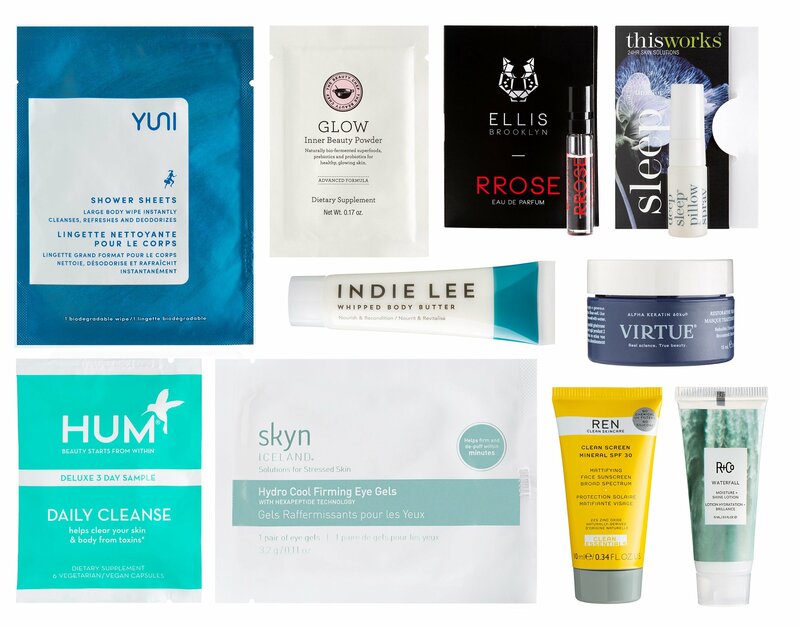 Receive 10 FREE Samples with your $100 purchase. Use code: JETSET. While supplies last. (4d) M-61 Hydrate & Glow Must-Haves $58. (5d) Dr. Barbara Sturm Advent Calendar 2018 USA $600 or at Olivela. (HOT) Use promo code WELCOME to ger an extra 10% off. The calendar contains 1 full-sized product, 21 deluxe sized products and 2 sachets (refer to the contents section for specific product details) € 1,017 | £826 | $1,154 worth of products.